Riding a bike is great for fun and fitness. Riding a bike can also be dangerous due to unsafe and inattentive drivers. Missouri revised statute 304.678 requires that drivers passing bike riders in the same direction do so safely and leave enough distance until they are past the rider. Bike lanes are great, but only if drivers stay out of them. If you have been driven off the road or cut off while riding a bike, give us a call and let us help you get compensated and hold those who fail to share the road accountable! Alvin was thorough and diligent in pursuing my case. I appreciate his hard work in generating my settlement. His office is quite efficient and Alvin responds quickly to phone calls and emails. 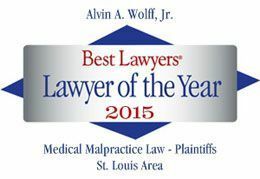 Alvin is knowledgeable about medical claims, insurance issues for both medical and automobile and has a wide network of contacts.